Fashion Flubs: Love It or Hate It? It seems Louis Vuitton is on a roll in trying to convince us that these fashion atrocities can actually be passed off as high end fashion. We feel sorry for the people who will purchase one of these over priced fashion flubs. 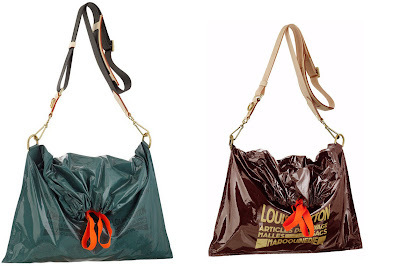 Louis Vuitton Raindrop Besace designed by Marc Jacobs. Ignore the fancy name and high price tag and this is simply a trash bag with straps. Louis Vuitton 'New Age Traveller Back Pack' priced at $26,000. 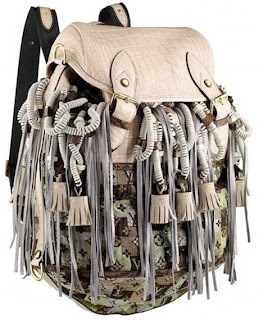 Remove the hideous phone cords and thrilly things and this could be a cute backpack. Definitely not worth $26,000. What do you think about these designs? Love it or hate it? Leave a comment. HATE IT, 26000 are they kidding!